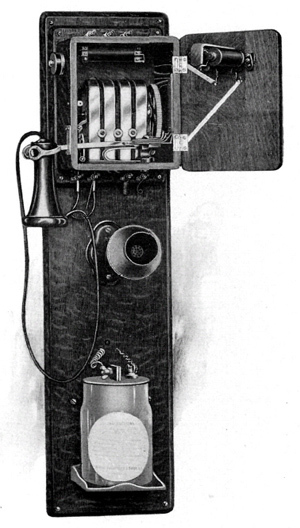 From the 1903 Kellogg Catalog: "This is the most compact type of telephone using a self-contained magneto box with a seperate battery cabinet, and before the advent of the compact telephone, was the standard instrument for exchange service. The magneto box contains a generator, ringer, induction coil, hookswitch and attached receiver, the whole being made easily removable from the backboard without unsoldering any connections. The battery box is also removable, being detached by forcing it upward so as to unhook its catches. A metal shelf fastened to the backboard is provided for a battery which can be either one cell of wet battery for local work or two cells of dry battery for both local and long distance talking."